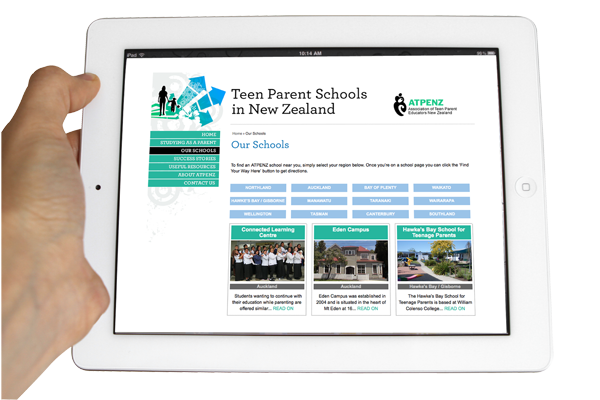 The Association of Teen Parent Educators New Zealand website is a resource for teenage parents wanting to continue their secondary schooling while pregnant, and once they have children. The site provides key info about the teen parent units attached to secondary schools around New Zealand, along with early childcare centres working alongside them. Ed’s brief was to rework the design and content of the Our Schools and Success Stories sections of the site, making them more user-friendly with navigation and display of the schools’ TPUs (teen parent units) and success stories. Also included in the brief was to make the entire site responsive so it could be viewed with ease on all mobile devices, an essential feature relevant to modern teenagers’ internet usage. Ed carried out the redesign of the two sections, and the content development. By supplying the client with a short QnA document to extract the key details of the pages, Ed gathered together and streamlined the content, before loading and styling into the CMS. SiteTools provided the back-end WordPress coding and adjusted the CMS to make it simpler for the client to use. In addition to reorganising the TPUs by geographical region, success stories were attached and linked to their relevant teen parent units (and vica versa). Also, each TPU had a sidebar link added so prospective students can now get Google directions with the ‘Find Your Way Here’ button, meaning wherever they are when visiting the site on their mobile device, they can follow directions to get to their nearest TPU. Anyway, without further ado, here are a couple of links to the work Ed carried out, so you can see how it works for yourself.